Choosing the right material and color of new rain gutters can sometimes be a daunting task. I will work with you to choose the gutter color that would best compliment your home. Our gutters are roll-formed on site to perfectly fit the specifications of your home. Seamless Aluminum is the most common choice of metal continuous gutters. Aluminum gutters are a great product. They don’t rust, and are available in popular colors. They are weather-resistant across the board and maintain their integrity in cold climates. The only problem with Aluminum gutters is that they can be dented by a heavy ladder. The solution to this problem is simple: don’t lean a ladder on your rain gutters. See below for available Aluminum colors. Steel Gutters are the second most common choice of metal continuous gutters. Although steel gutters prove to be more durable and can withstand ladders and fallen branches, even galvanized steel can eventually rust through. 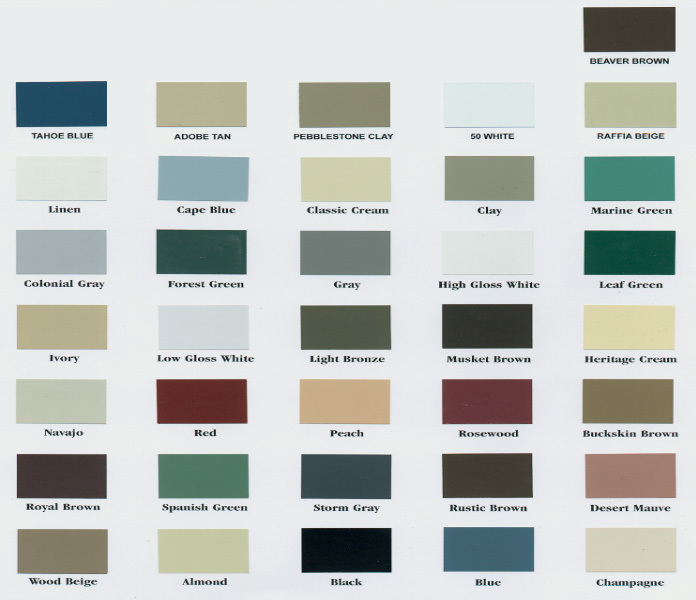 See below for available Steel colors. Stainless Steel is a high-end seamless gutter material option. Stainless steel gutters are strong, rust-free and can maintain their high sheen for years. As they say, " you get what you pay for" and for this type of gutter, that is definitely true. At Coast Gutters we offer the hard-to-find Stainless Steel Spikes that prevent electrolysis (weaker of two metals rusting) on your gutters.